Stevenson underwent surgery last Saturday night. Stevenson’s condition is critical but stable. Stevenson is in an induced coma. It’s still too early to know what the long term outcome is on Stevenson’s medical situation, according to his doctor. “Mr. Stevenson underwent surgery on the night of Saturday to Sunday and has since been hospitalized in the intensive care unit. He suffers from severe traumatic brain injury. Although critical, its situation is still stable under the circumstances,” said Dr. Alexis Turgeon, a specialist in intensive care medicine at the Enfant-Jésus Hospital of the University Hospital of Laval at chudequebec.ca. Stevenson (29-2-1, 21 KOs) was ahead of the fight on two of the judges’ scorecards going into the 11th round at the Centre Videotron, Quebec City. Gvozdyk (16-0, 13 KOs) hurt the 41-year-old Stevenson with a big shot. Gvozdyk then opened up with an eight-punch flurry that dropped Stevenson. Referee Michael Alexander stopped the fight at once. In the previous round, Stevenson had hurt the 31-year-old Gvozdyk with a left to the head that caused him to fly into the ropes, which kept him from falling down. The referee let the action continue without giving Stevenson credit for the knockdown. Stevenson then tried his best to KO the hurt Gvozdyk, but he it was no use. Gvozdyk recovered well, and came on at the end of the round to hurt Stevenson with a four-punch combination. Stevenson looked in bad shape at the end of the round in walking back to his corner. He looked tired and hurt. “His condition requires mechanical respiratory support, deep sedation and specialized neurological monitoring. It is too early to comment on Dr. Stevenson’s long-term prognosis,” said Dr. Turgeon about Stevenson. Before last Saturday’s fight, Stevenson had held the WBC 175 lb. title for five years since 2013, and was viewed as one of the best fighters in the light heavyweight division. Stevenson was the longest reigning champion in boxing, and one of the best punchers in the sport. The timing for the title defense against Gvozdyk was not the best for Stevenson, as he was coming off of a 12 round war with former two division world champion Badou Jack last May in Toronto, Canada. The Stevenson-Jack fight was scored a draw. Stevenson took a lot of heavy shots in that fight from Jack, and it by far the hardest fight for him since his 2nd round knockout loss to Darnell Boone in April 2010. Considering how hard of a fight the Jack-Stevenson fight turned out to be, would things have been different if Stevenson had rested for the remainder of 2018 before defending against Gvozdyk in 2019? We’ll never know. 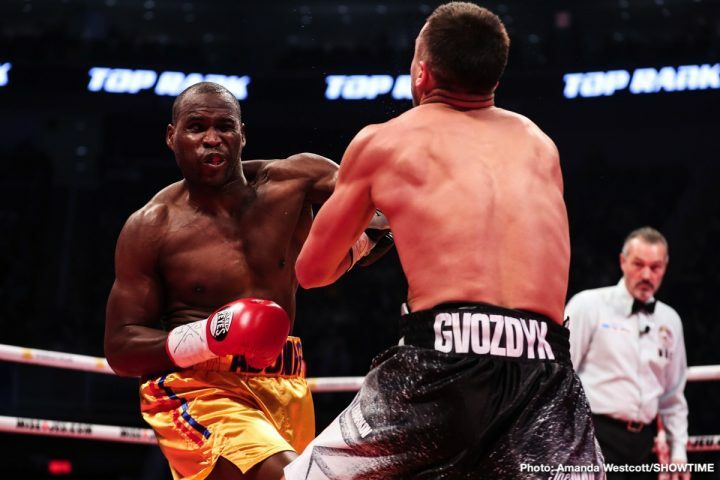 Stevenson showed his warrior heart and plowed ahead and defended his title with huge courage and pride last Saturday night against one of the best upcoming fighters in the light heavyweight division in Gvozdyk.